Nestled within the lush grounds of Devil’s Corner vineyard sits the upgraded Cellar Door and Lookout for Brown Brothers. 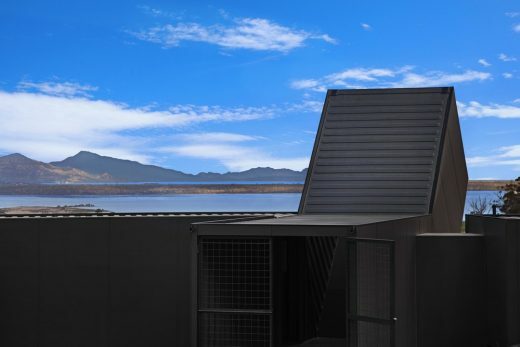 Reopened in December 2015, the project seeks to create a new tourism experience by combining a lookout, cellar door and complimentary food experiences in the heart of the scenic East Coast of Tasmania. The Cellar Door & food market have been collected around a courtyard space which allows shelter and respite from the surrounding environment, while providing views through the tasting space to the Hazards beyond and access to open deck spaces. 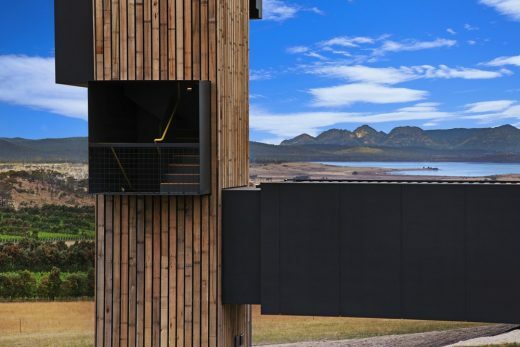 The lookout, while providing a picturesque panorama over the Freycinet Peninsula and acting as a visual signifier for the site, also invites visitors to visually explore the landscape through the careful placement of a series of timber clad shipping containers. The three distinct spaces reference different and unique views of the site – firstly the SKY, then the HORIZON and lastly the TOWER, which provides an elevated and expansive view of the bay below. Together, these experiences have been designed as a loose collection of timber clad buildings that, through similar aesthetic and material treatment, form a modern interpretation of traditional farm / rural settlement that gather over time. 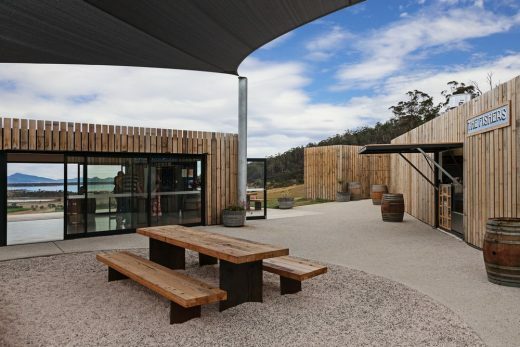 Located on the scenic drive along Tasmania’s East Coat, the new Devil’s Corner Cellar Door and Lookout sits within one of Tasmania’s largest vineyards, with a panoramic view over the Freycinet Peninsula. 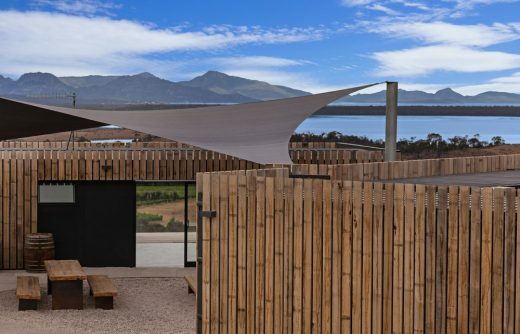 Reopened in December 2015, this project for Brown Brothers seeks to amplify the experience of this iconic view to create a new tourism experience on the East Coast of Tasmania. 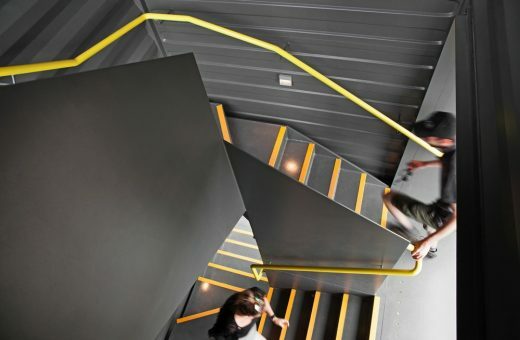 Originally a small demountable building, the Cellar Door has been extended and expanded, paired with a lookout and complimentary food experiences, providing a backdrop for seasonal events. 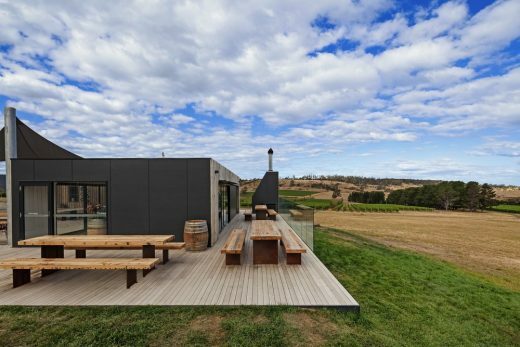 The Cellar Door and Lookout were designed as a loose collection of timber clad buildings that, through similar aesthetic and material treatment, form a modern interpretation of traditional farm / rural settlement that gather over time. The Cellar Door & food market have been collected around a courtyard space which allows shelter and respite from the surrounding environment, while allowing views through the tasting space to the Hazards beyond and access to open deck spaces. 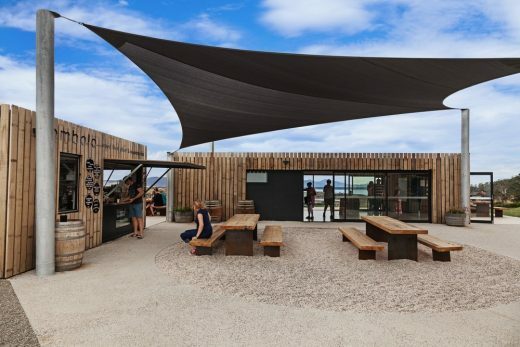 Through the careful placement of a series of timber clad shipping containers, visitors are invited to visually explore the landscape within and around the vineyard through curated framed views. The lookout element is a critical component of the design, not only in providing a visual signifier for the settlement but also as a way of interpreting the landscape from which the Devil’s Corner wines originate. In the same way that an appreciation of wine can be gained through understanding its subtleties and varying ‘in-mouth’ sensations, there are many ways landscape can be appreciated. The lookout plays with this idea. The three distinct spaces reference different and unique views of the site – firstly the SKY, then the HORIZON and lastly the TOWER which winds its way upward providing views to each of the compass points before culminating in an elevated and expansive view of the bay. 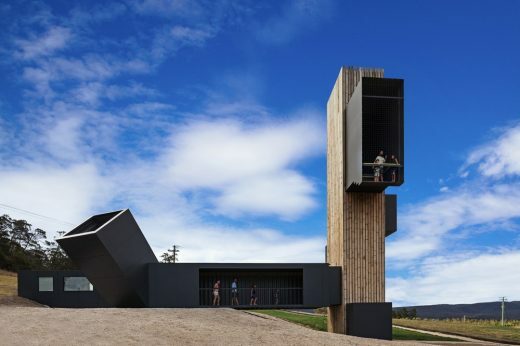 By creating a dynamic scenic lookout and providing associated facilities, visitors are drawn to the new upgraded cellar door for the Devil’s Corner wine label. Steel was an ideal material for the project as it allowed for a large amount of structure to be prefabricated off-site, providing timing and logistics advantages for the remote location. The underlying structure of the buildings and tower for the Devil’s Corner is made from repurposed and adapted shipping containers, chosen not only because of their easily transportable modular size, but also because of their structural integrity and steel’s inherent flexibility and ability to be modified. A total of 10 containers have been used – 5 in the lookout and 5 in the market area. The integral strength of the containers made them a perfect choice in the construction of the lookout in particular, enabling the structure of the building to be delivered to site and erected quickly. 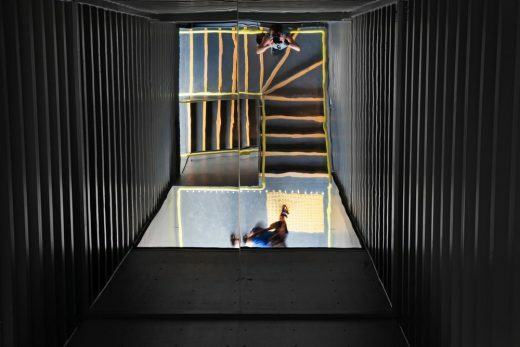 Each container has been modified in various ways – the cranked ‘sky’ lookout cut from two parts of a container and reassembled; the ‘horizon’ lookout which is able to bridge between land and the ‘tower’ despite one side being cut out; and the ‘tower’ lookout constructed from two containers end on end, inside of which a steel plate stair winds its way up past projecting landings on each side. 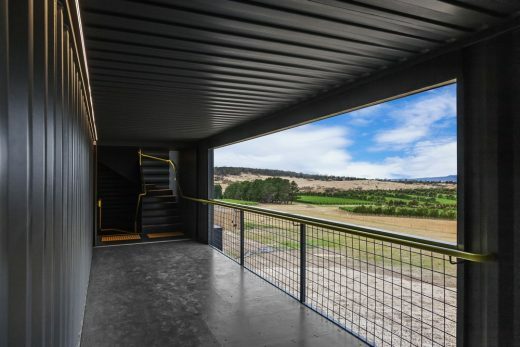 These landings provide views over the landscape as the viewer moves up the tower; the black steel box frames fixed to the container and cantilevering over the vineyard. Craned into position in parts, the lookout’s structural integrity relies on all of the pieces locking in together. The design deliberately reverses the typical aesthetic treatment of steel. 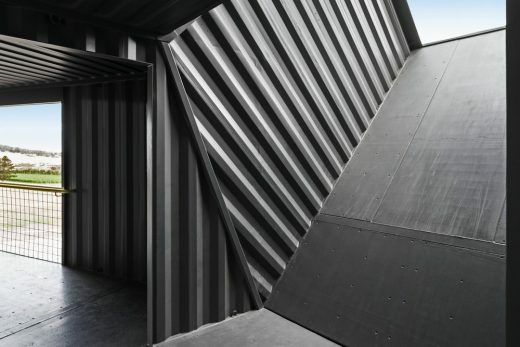 Rather than cladding the building in steel, it has been expressed internally, revealing the raw, industrial nature of the construction and hinting at the industrial underpinning of the production process. 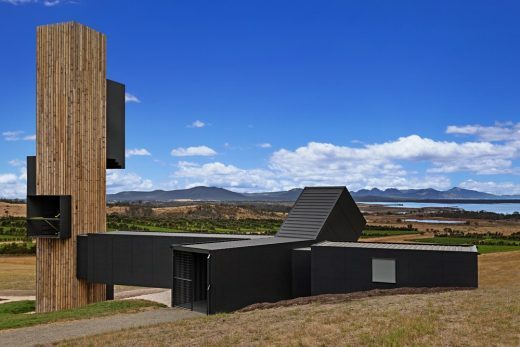 The external timber cladding (which acts as an visual screen only) plays on the rural / agricultural qualities of the site, with the internal steel skin being revealed in a consistent manner through the expression of each of the openings – the apertures in the lookout and opening to the cellar door.